You prefer active pets and can�t see the point of very small creatures such as goldfish or hamsters, so you enjoy a lively dog. Greyhounds and working dogs of all kinds will suit you. Almost any pet will suit you and it is unlikely that you will go through life without an animal. You would particularly enjoy the comfort of a playful and pretty cat. Many of you are real softies when it comes to animals, and you are bound to have at least one. Some Geminis have too many pets, but for most this is too much hard work. You prefer cats and dogs and generally two at a time. Some Cancerians love animals while others can�t be bothered with them.If you do have a pet, it is more than likely to be a cat. 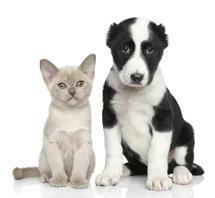 You love beautiful animals, such as pedigree cats and horses. If you decide on a dog, you may end up with something larger than you can handle. You enjoy very small animals like hamsters and attractive fish. You prefer small breeds of dogs, small caged animals and tropical fish.Cats suit you because they�re clean, graceful and independent. You only take on a pet that can look after itself or one that looks very good. A beautiful Burmese cat or pair of tropical fishes will suit you. Being an all or nothing sign, you either love animals or loath them. If you love them you can cope with very large animals that need to be trained to behave, or you go for unusual options such as snakes and reptiles. You may prefer animal to human company. You�ve such an instinctive feel for animals, it�s unlikely you�ll go through life without at least one pet. It really upsets you when your pet�s ill. You get on well with horses and hunting dogs. You�re fond of small animals and probably have one or two around the house,and feel they should be part of family life. You are very responsible and sensible enough to look after a pet well. Being the oddball of the zodiac, you �re likely to keep snakes, reptiles,goats, rats, a horse, a donkey and several birds. You need the right kind of living accommodation to suit your menagerie. You won�t choose a pet, it�ll choose,you. A stray, an orphan or rescue cat/dog will find its way to you. If there�s a lame duck around, you�ll be the one to take it in.